We are pleased to announce that this year’s Kids On Track Golf Tournament will be held Monday, September 21, 2015 at the fabulous, private Mesa Verde Country Club in Costa Mesa. We invite you to help us make our 2015 Kids On Track golf tournament the biggest yet. Last year’s event was a huge success! Please join us as a sponsor, golfer or donor and help us raise money for our award-winning mentoring and leadership programs that serve the most at-risk kids in Orange County. We need your help, through a sponsorship, foursome or auction donation to ensure that this year’s tournament is our largest fundraiser to date. All of the funds raised will benefit America On Track’s Mentoring & Leadership Programs throughout Orange County. America On Track is about hope, opportunities, and life-transforming programs. 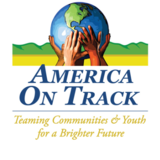 For 20 years, America On Track, a non-profit organization, has been providing services throughout Orange County and is currently serving 10,000 individuals annually through innovative programs that transform the lives of disadvantaged youth through mentoring, fitness, nutrition, leadership and risk-prevention programs. All programs are science-based evaluated and 93 cents of every dollar goes directly to program services. Your support can help our youth achieve a brighter future!